We almost always include leis in our packages because the Hawaiian ceremony is known for the important lei exchange between the bride and groom. The bride will typically receive a flower lei and the gentleman a lei made from a green leaf (either the ti leaf of the maile leaf). The lei exchange is done at the beginning of the ceremony and is often done with a hug and a kiss. If you are having guests at your wedding it is often a good idea to get additional leis to present to them after your lei exchange. This practice makes the guests feel honored to be part of your ceremony and is a nice gesture for those that traveled great distances to be at your wedding. A bouquet for the bride, a boutonniere for the groom and floral arrangements set the mood for your wedding photography and video production. 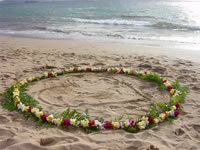 The most popular flowers in Hawaii are Plumerias, Orchids, Gardenias, Tuberose and Pikake. The colors and fragrance engage our senses and carry us into a time beyond past and future. You do have options on what we can provide. Examples of the leis can be seen to your right and below we have just some of our bouquet options. Call 1-800-871-2758 to discuss your wedding flowers. You can even send us an email with photo examples of what you desire. The 1st two rows arestandard bouquets and the third row are examples of our deluxe cascading bouquets.